Nuvadi Dawahoya is a young carver (under thirty) who learned his craft growing up on Second Mesa of the Hopi Reservation. He now makes his home in Albuquerque. 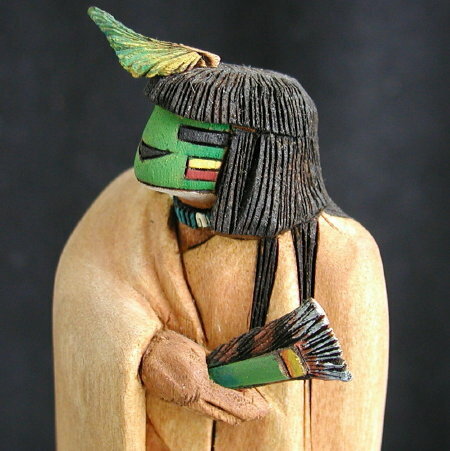 He is an award-winning carver who has developed a very recognizable style of smooth-bodied kachinas with very detailed carving of the heads and his maidens often hold fans or ears of corn in one hand. This is one of Nuvadi's Hopi�Maiden dolls--he does various renditions with the distinction being the color of the face and necklace. This is his characteristic smooth carving of the upper part of the body which is draped by a blanket which obscures most features. This has the right hand coming out from under the wearing blanket and holding a feather fan. This is, of course, carved from cottonwood root.